After all, Valentine’s Day is almost a week away. And nothing says “I love you” like a homemade edible gift! Especially if it involves chocolate. After all, Valentine’s Day without chocolate is like a beach day without sunshine! And you know what else is quickly approaching? Almond Day! February 16th is the day to celebrate all things almonds. So I decided to bring you the best of both worlds and share a recipe that involves almonds, chocolate and a little kick from some cinnamon and cloves. Believe me, you won’t be able to stop eating these delicious Spiced Chocolate Covered Almonds! I know some people are all about the expensive bling for V Day! Well, Valentine’s Day for Tim and I comes at a weird time. You see, our anniversary is January 6th, right after the holidays. By the time February 14th is here, we are usually broke from all the Christmas and anniversary gifts. So we are all about the edible stuff! No surprise there, since we are both big time foodies. The beauty of it is that edible gifts don’t have to look perfect. Rustic = homemade = “I made this for you with all my love and my own two hands!”. Or maybe that’s my lame excuse for my chocolate covered almonds not looking as glossy and shiny as the store bought ones. ??? But I can guarantee they taste so much better! They are also a ‘good for you’ snack. Yes, even though they are covered in chocolate! Besides, you can always use dark chocolate for an even better option. It’s just that my big sweet tooth self likes a little more sweetness from the bittersweet chocolate. ? And then there’s the almonds. Oh, almonds, how I love thee! Almonds are healthy, full of nutrients and good for your heart! Additionally, they are a great source of protein and fiber while naturally low in sugar. The point for all this? Make a double batch of this recipe. Give one to your dear valentine and keep one to yourself. Ya know, just as a healthy snack! ? Arrange almonds in a baking sheet and roast for about 10-15 minutes, or until a nutty aroma wafts out of the oven. In a saucepan, combine the brown sugar, water, cinnamon, ground cloves and salt and cook, over medium heat, until the sugar melts and the mixture thickens slightly. Add the warm almonds and mix well until all the almonds are coated with the sugar mixture. Spread the spiced almonds in a baking sheet lined with parchment paper and bring to the fridge to cool for 20 minutes. 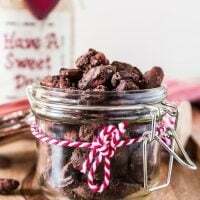 While the almonds are cooling, melt the chocolate using a double boiler or in 30 seconds increments in the microwave (stirring after each time). Remove the almonds from the fridge and break apart any clumps. Dip each almond in the melted chocolate and place them in the parchment paper lined baking sheet. If you, like me, are not as patient, you can place all the almonds in a bowl and add the melted chocolate, stirring so all the almonds are coated. They won’t look as perfect, but they will taste just as good! Place the chocolate covered almonds in the fridge to cool, for at least 30 minutes. Once they are set, transfer to an airtight container (or cute glass containers for gifting) and store in the refrigerator until ready to eat.